My name is Becci Holcomb. I am 26 years old. I am from Blanchester Ohio. I graduated from the University of the Cumberlands in Williamsburg, KY with a degree in biology and public health. While at UC I was on the track and field team where I threw shot put, discus, weight throw and hammer. I came to Georgia last summer to further my education at Life University's College of Chiropractic. 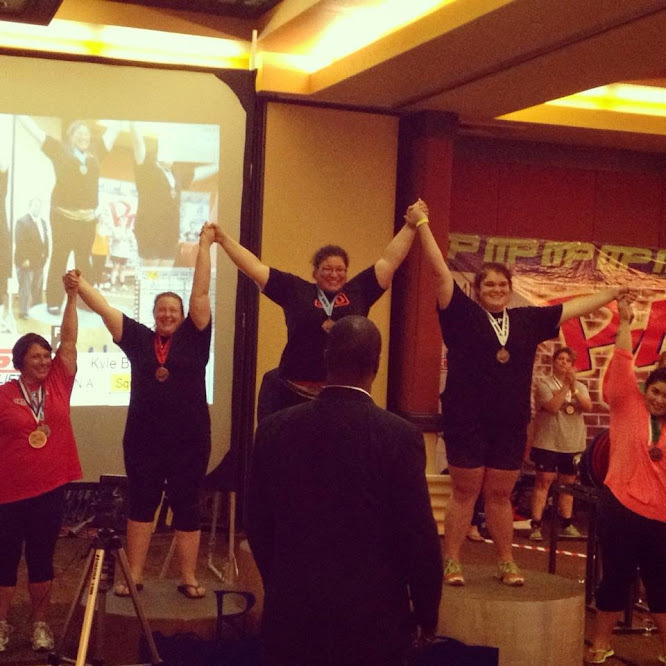 My last competition was USAPL Raw Nationals in Aurora CO. I did well. I placed 2nd in the open with a total of 505.0 kilos. My squat and bench press were meet PR's of 185.0 kgs and 92.5 kgs. My deadlift was an all time and meet PR of 227.5 kilos. Last but certainly not least., I also qualified for the 2015 Arnold Sports Festival. I started training in October, 2013. My first full-power competition was April 5th at the USAPL Georgia Spring Open in Savannah. 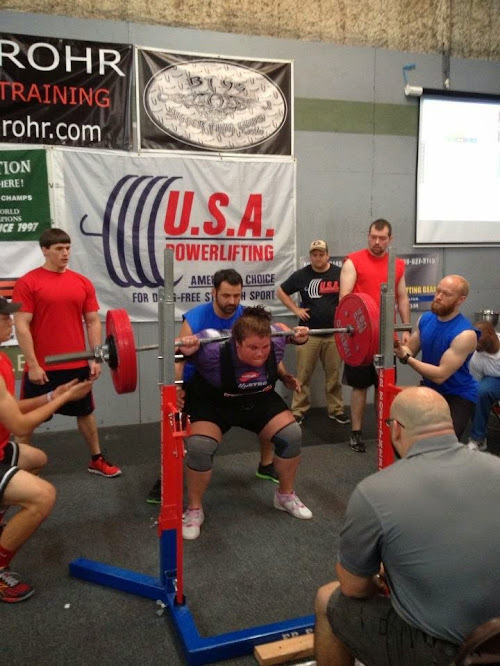 Before that, I competed in a USPA deadlift only meet in December, 2013, pulling 402 lbs. I improved by going 9/9 on my lifts and adding 25 kilos to my total. My next competition will be in October; the USAPL Georgia and Southern States Powerlifting Championships. I don't really plan on doing anything differently. I train with team PrettyStrong with Vanessa Gale at Crossfit on the Square in Marietta. Other than going to classes and studying, I enjoy concerts, hanging out with my friends, reading, eating and making food. Normal stuff. Hahaha! My role model would have to be my father. All my life he has been an example of what a person should be. He is kind, caring, hard working, patient, a great father and a great former athlete. He was on the 1984 Olympic Wrestling team. He has done nothing but encourage me to pursue all of my dreams. I am the oldest child of ten. I have five brothers and four sisters. I grew up on a small farm. Carrying fifty pound bags of feed around helped prepare me for a powerlifting career, or maybe it was all the push-ups, sit-ups, and squats I had to do when I got in trouble. I am still really new to the sport, so I don't really have any complaints yet. I am a full time doctor of chiropractic student, so sometimes it's hard to juggle classes, studying, training and a personal life. I've had many late nights and early mornings. 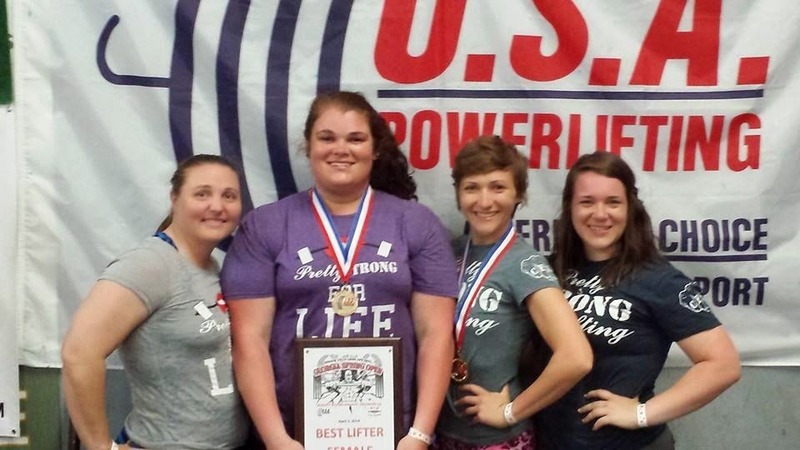 I got into powerlifting last October via fellow classmate and future teammate Stephanie Mahan. Steph and I went to a “Fun.” concert, and while we were there we talked all about powerlifting. The next day, I set up my intro with Vanessa. The rest is history. Right now I'm just a team player. in the future I would love to become a certified coach and start a powerlifting team wherever I end up practicing chiropractic. My best numbers are 420 lbs. 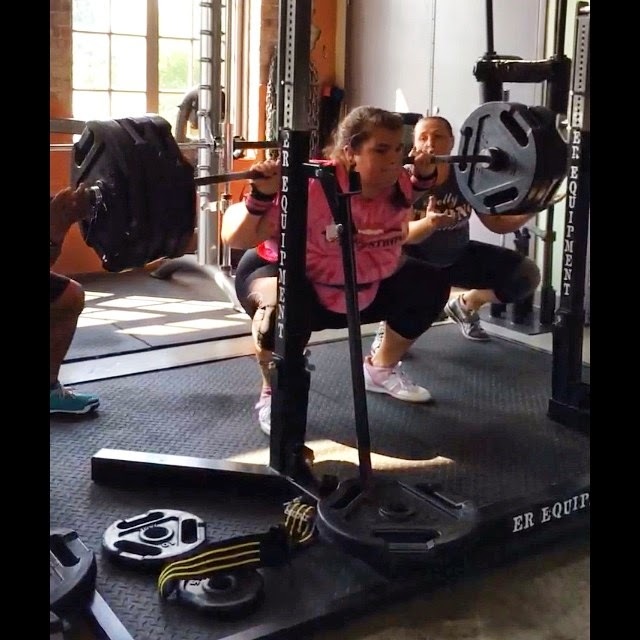 squat, 210 lbs. bench press, and 501 lbs. deadlift. My squat training numbers are slightly higher because two weeks before nationals I injured my ankle really bad. My doctor thought I had broken the distal end of my fibula. Luckily, it was just a bad sprain. I wasn't able to squat for the remaining weeks leading up to Nationals, so my squat attempts were conservative, finishing with a 407 lbs. squat. As for my bench press, I knew I could have done more on the platform, but I went into Nationals wanting to go 9/9 so my successful third attempt was 204 lbs. My deadlift on the other hand was a 21 lbs PR! 501!!!!! Enjoy the newbie gains because they won't increase this fast forever. Work hard and trust the process. Despite what you may think, your coach knows best. My short term goal is to continue training hard and just do the best that I can do. One day, I would love to compete at IPF Worlds. I would also love to break the world record deadlift in my weight class. I am less than 30 pounds away from it right now, so I think it's a feasible goal. I haven't been around powerlifting very long but out of everyone I have watched, I would have to say my favorite is Sioux-z Hartwig Gary. "Though she may be little, she is fierce!" My training philosophy is really just to go out and work as hard as I can. My favorite lift would have to be deadlift. It has always come naturally for me. The only rival is myself. My goal is just to get out there and do the best that I can do. Hopefully, while I'm doing that I'll hit some PR's and see lots of white lights. Hmmm... probably that I made it another year with some of my favorite people. Team PrettyStrong is my family. Joining the team was one of the best things I've done. The team and family atmosphere is just what I needed after moving to Georgia. I would like to say thank you to my coach Vanessa Bell, my training partner Dave Bell, my PrettyStrong family, Dr's Matthew and Elizabeth Christopher, Dr. Eric Partin and everyone at Crossfit on the Square. Without these guys, I wouldn't be here.